The belt clamp consists of the mount, 3/4" screw with nuts, retainer with the tightening screw and UHMWPE belt pad. Make the mount and retainer from SVG or PDF template, according to the instructions in Howto section. Using vise and hacksaw, make two grooves for XL belt in 1/2"x3/8" piece of UHMWPE left over from making sliding elements. Teflon strip will also work and it's very easy to cut with a knife. 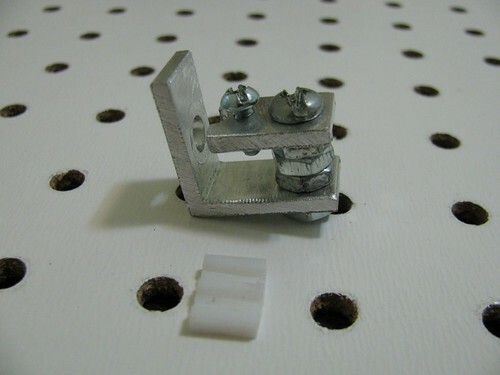 Install 3/4" screw into the retainer, tighten it with a nut and install 2 more nuts on the screw. Thread 6-32 screw into the 1/8" hole in the retainer.